The old Camden City School District headquarters, formerly an RCA building, has been sold again for $13.5 million. Located at Front and Cooper Streets, the eight-story building has been called the most historic place for recorded music in the world. It is where the Victor Talking Machine Co. built a music dynasty in downtown Camden, churning out records and legendary artists such as Louis Armstrong, Tommy Dorsey, Duke Ellington, and Billie Holiday recorded for the label. Last year, a developer announced ambitious plans to transform the site into a commercial office space with a nod to its musical past, including a Victor museum, a recording studio, a rooftop restaurant with a scenic skyline view, and an entertainment venue. The proposal called for bringing back the studio and stage where artists recorded and live orchestra performances were held. But that lofty vision was scrapped when Millennial Place sold the building to EMR Eastern, marking the second time the property has changed owners in just over a year. Instead, the building will bring more office workers and another business venture to the bustling waterfront. The Bellmawr-based company plans to relocate its national headquarters and about 120 employees to the 90,000-square-foot building by the summer, said president Joseph Balzano Jr. The total project is expected to cost about $33 million after renovations, he said. The interior had been gutted by the previous owners and few changes are planned for the outside, except replacing broken windows, Balzano said. The lobby and seventh and eighth floors where phonograph recordings were made by Enrico Caruso and Camden’s Russ Columbo and where Sinatra signed his first contract with Victor Studios will be preserved, he said. 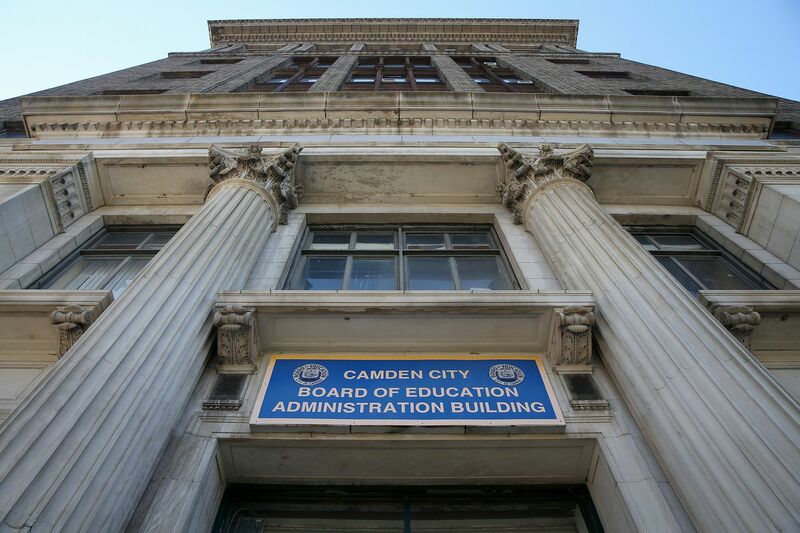 The former Camden City School District headquarters, once part of the RCA complex in Camden, has been sold for $13.5 million to a metal recycling firm. Fred Hagen, president and CEO of Hagen Construction, said he never committed to transforming the property into a Victor museum. His company took over the property from Millennial Place and became the sole owner and sold the building to EMR. Hagen said his firm preserved and maintained the building’s historical elements. Selling the property to EMR returns the building to what “it was originally, a U.S. headquarters for a healthy and viable business,” he said. The building is part of what little remains of the former 58-acre industrial Victor Talking Machine Co. complex. The company began in a small machine shop on Front Street that produced Victrolas. It grew to a massive operation that covered the equivalent of 10 city blocks, churned out 800,000 records a day and had sales over $400 million. The company was sold to the Radio Corp. of America in 1929, then morphed into a General Electric division in 1986. Astronauts Neil Armstrong and Buzz Aldrin used backpack radio systems built at the RCA facility to communicate on the moon. Entrepreneur Graham Alexander, who launched a Victor-themed musical venue and archive Vault at Victor Records in Berlin, was among the tenants who had hoped to lease space in the Victor building. Alexander plans to open a manufacturing facility in Merchantville this spring. Formerly known as Building No. 2 during the heyday of the Victor Co., the building was the headquarters for the Camden School District for many years. Millennial Place, a partnership between Millennial and Hagen Construction, purchased the building in March 2018 for $5.2 million. EMR received $253 million in tax incentives to put up a campus in Camden that includes its headquarters and an advanced metal recovery facility. It is part of a recent wave of relocations and investments induced by the tax breaks to lure companies to the city. The city’s Historic Preservation Committee last month approved EMR’s plans for the Victor building, but asked the company to preserve as much of its history as possible. The company is expected to appear before the Planning Board in March for approval of the project. A warehouse next to the Victor building where Bill Clinton and Al Gore made their first presidential campaign stop in 1992 will be demolished to make way for a parking lot, Balzano said. The company plans to erect a marker on the site to memorialize that. Residents in the nearby Cooper’s Grant neighborhood are also hoping that EMR will re-create a mural on the warehouse that depicts Walt Whitman and baseball players elsewhere in the community. They also want the company to resume using a landmark flagpole atop the building that was damaged during Hurricane Sandy. A mural painted by students at Creative Arts High school on a warehouse adjacent to the Victor RCA building in Camden shows Walt Whitman and baseball players. The warehouse will be demolished when the building's new owners move in to create a parking lot. While many bemoan the demise of a once promising opportunity to capitalize on Camden’s music history, others are relieved that the building has a viable future with a new owner. Camden County Freeholder Director Louis Cappelli Jr. called the sale “yet another significant sign of economic expansion” in Camden. The seventh floor, which housed executive offices for RCA Victor, is pictured at the Camden City School District headquarters, formerly an RCA building, in Camden. The school district put the building up for sale in December 2016, with a $6.7 million asking price. The district paid about $2 million for the property in 2006, but it no longer needed so much space. The central office relocated last year to the old Washington School in Cramer Hill. The iconic RCA Victor building No. 2 on Cooper Street in Camden was part of Victor's campus where phonograph recordings were made. Plans to bring music back to the building have been dashed with a sale to a new owner. It sits across from another Victor building that was transformed into Camden 's first luxury apartment building by Philadelphia developer Carl Dranoff, the Victor Lofts. Dranoff is embroiled in a bitter legal dispute with the city over the sale of the apartment building. Balzano said his company, which recently opened an auto dismantling facility in Camden, will eventually house about 150 employees in its new building. EMR, which has about 2,000 employees in the U.S., also has locations in New Orleans, Dallas, and Minnesota.